Did the US trick India and China into war in 1962? New Delhi, February 13: It is now well known that in 1971, as the Indian armed forces were scything through Bangladesh, then US President Richard Nixon’s National Security Adviser Henry Kissinger met a high-ranking Chinese official (believed to be Huang Hua) to urge the People’s Republic to open a front against India to pressure India into backing off. The Chinese did not bite. But back in 1962, the United States may well have conned the Chinese into taking action against India by its airdropping of Tibetan Khampa guerrillas and making the Chinese believe that it was India which is attacking. In his book on this, “JFK’s Forgotten Crisis: Tibet, the CIA and the Sino-India War,” Bruce Riedel strips the mask of what happened prior to the 1962 war. Reidel was a top CIA official and its in-house expert on South Asia. He is now a senior fellow at the Brookings Institution and Director of the Brookings Intelligence Project. Reidel writes with immense knowledge and access to hitherto top-secret documents, but with eloquent brevity. He tells all and says all without using up many lines of wordage. He has an eye that can focus with hawk-like precision on relevant details and keep looking at the big picture too. The complex tale of the evolution of India-US relations is well known. But the close tango by the two for a brief period in 1962 is little known and seldom told. Ever since its birth as a Communist state, China and the US had an intensely adversarial relationship. India’s choice of remaining uncommitted during the age of containment and the Cold War, and Pakistan’s geography making it a ‘frontline’ state and its political choice of becoming a Cold War partisan, largely shaped Indo-American relations, as they do even now. 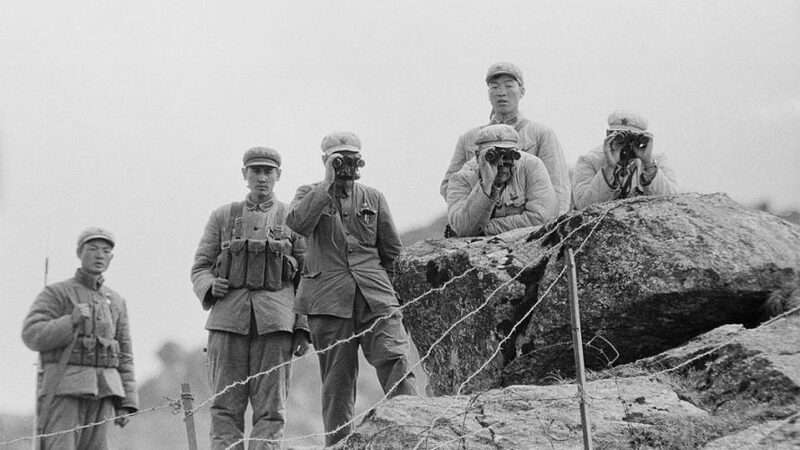 In 1950, China entered the Korean War against the American-led UN-forged alliance. It will be worth remembering that India sent a military medical unit to Korea to serve with the UN forces. Nevertheless India served as a conduit between Communist China and the US that helped them come to the table at Panmunjom to end the Korean War. The US had also conveyed its threat to use atomic weapons should the PLA continue with its offensive via India. The Chinese, like now, and even then, were concerned about a US-Indian collusion, and didn’t take Jawaharlal Nehru at face value. India and China were never neighbors. India’s northern neighbours were always Tibet and Xinjiang. These two territories have a long history of being alternately under China’s over-lordship and free. In 1947, when India became independent, both these nations were enjoying freedom from China. Xinjiang was an independent Soviet republic under Russia, and Tibet was enjoying full political freedom. In 1913, the Tibetans declared independence after the collapse of the Qing dynasty and the establishment of a republic in China under Sun Yat Sen. They attacked and drove the Chinese garrisons in Tibet into India over the Nathu La Pass. Also, in 1913, the British convened the Simla Conference to demarcate the India-Tibet border. The British proposed the 1914 McMahon Line, as we know it. The Tibetans accepted it. The Chinese, however, initialed the agreement under protest. On October 7, 1950, the Chinese attacked the Tibetans at seven places on their frontier and made known their intention of reasserting control over all of Tibet. As if in response, on February 16, 1951, Maj. Relangnao ‘Bob’ Khating raised the Indian tricolour in Tawang, and took over the administration of the tract. The point of this narration is to bring home the fact that India’s claim over Arunachal Pradesh doesn’t rest on any great historical tradition or cultural affinity. We are there because the British went there. But the Chinese also have no basis whatsoever to stake a claim, besides a few dreamy cartographic enlargements of the notion of China among some of the hangers-on in the Qing emperor’s court. After Independence, the relationship between the United States and India was cold and often thorny due to America’s containment policy that sought the active participation of the neighbors of all Communist countries in their ring-fencing. Pakistan, with its eye on India, happily became a length of this ring fence. India-US ties further soured with India actively and stridently espousing ‘non-alignment’. 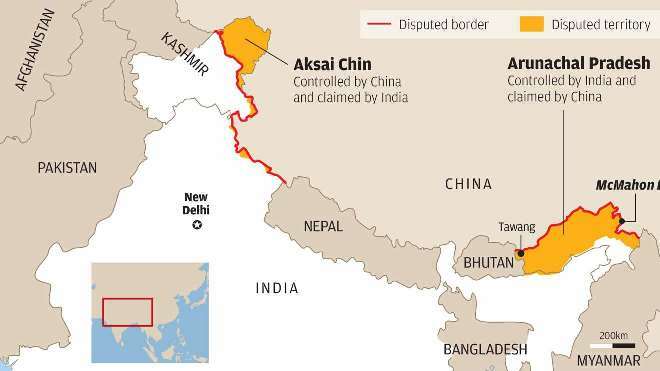 But in 1959, the long-festering Sino-Indian border dispute sprang into the open when the Dalai Lama once again sought refuge in India. The Chinese saw it as yet another proof of India’s inimicality towards it. There were other things happening that further convinced the Chinese of this. In 1950, the CIA office in Calcutta established a link with the Dalai Lama’s older brother, Thupten Norbu. The US was keen to use Tibet to open up another front against China. Which is exactly what they did in 1957. 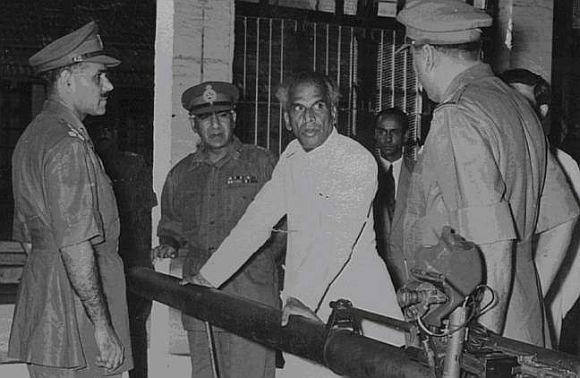 Defense Minister V.K.Krishna Menon with top Indian Generals during the 1962 war with China. The CIA began training Khampa warrior tribesmen from Amdo, the home district of the Dalai Lama, in Colorado, where the high altitude almost mirrored Tibetan conditions. The CIA established a forward base for them at the then Pakistani airbase at Kurmitola near Dhaka. They then parachuted sticks of them into Tibet to lead the expected insurrection. Very few survived. The US was also to later use this airbase, as well as the airbase at Peshawar, to launch U-2 flights over China and Russia. The Chinese believed that the Tibetans were being airdropped by the Indian Air Force and protested several times about ‘Indian’ air incursions. New Delhi didn’t seem to have a clue about what these protests were about. The Americans were quite happy to make the Chinese believe just that, as it served the added purpose of discomfiting Jawaharlal Nehru’s government, which had made the ‘Panchsheel’ doctrine the cornerstone of its foreign policy. In 1960, newly-elected US President John F. Kennedy initiated a foreign policy change that envisaged India as a democratic bulwark against Communism. JFK invested heavily in this notion and sent a top Presidential confidant, John Kenneth Galbraith, as the US ambassador to India. Galbraith quickly established a rapport with Nehru and began to be counted as a personal friend of the PM. 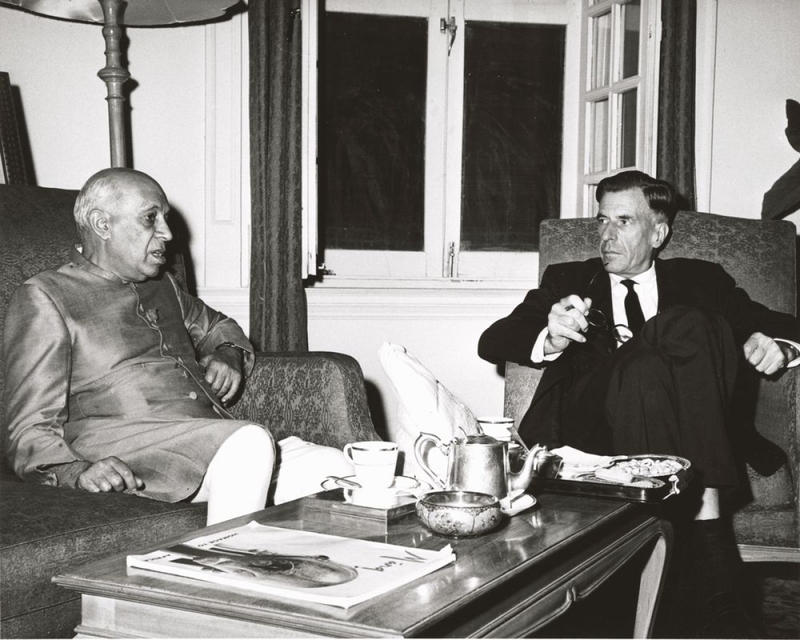 Galbraith was also a famous economist and Nehru turned to him for advice on domestic policy matters as well. Galbraith worked his connections with the White House to sponsor a US $1 billion economic assistance package for India. A billion dollars was a colossal sum of money those days. Clearly, JFK was putting his money where his mouth was. This only alarmed the Chinese and confirmed to them their still widely held notion of the perfidious Indian. Mao Zedong believed that Nehru was two-timing China with talk of ‘Panchsheel’ while trying to create a rebellion in Tibet to reestablish it as a buffer, as did the British. When India and China began playing their silly forward policy of establishing their posts ahead of each other, skirmishing was inevitable. Within China, Mao was waging a battle against the factions led by Liu Shaoqi and Marshal Peng Dehuai. India became a good excuse for Mao to berate the Marshal and the PLA. He then demanded action. The aggressive moves near the Thagla Ridge at the India-China-Bhutan border was a readymade situation which the Chinese exploited, and India was sitting with its chin stuck out. An ill-equipped military along with an ill-informed political leadership made the knockout almost inevitable. The writer, a policy analyst studying economic and security issues, held senior positions in government and industry. He also specializes in the Chinese economy.